Who do you sew for the most, yourself or others? And what do you make? Sweepstakes Rules: Open to residents of the 50 United States and the District of Columbia. One comment per fan. Comment must be submitted to the WeAllSew.com blog by Thursday, October 2, 12:00 midnight Central Time. Winner will be chosen randomly. Winner will be notified by email and will have 48 hours to contact us at WeAllSew@berninausa.com to claim the prize; winner will be announced on WeAllSew about one week after contest ends. The majority of my sewing consist of table runners, baby quilts, lap quilts, and bed size quilts. I keep very few of my quilts, they are usually gifts. When my children were younger, I use to sew for them all of the time. The only sewing that I do on clothing is repairs and hems. Thank you for this site and Berry Patch Fabrics in Fort Worth, TX that can help me with all my Bernina needs. I sew for myself mostly, primarily clothing. These days I am focusing on that ever-difficult garment, pants. There are a few exceptions to my self-sewing, such as alterations for my spouse and occasional home deco or gift items. I mostly sew clothes for my daughter. She loves wearing Mom-Made dresses! I also sew for myself but given the choice between me or her, she wins every time. Quilts mostly and they are given away as gifts. Most of my sewing is quilting and most of that goes to family, friends, or charity. Some of my sewing projects are items that I test out to have my young grandchildren sew. They love using my favorite power tool! I sew things that I love, then find the right person to give it to. Usually quilted wall hangings or something embroidered. I make quilts and all things related to quilting, and anything I can embroider and quilt makes me happy! My family and friends are the receivers of my quilting and embroidering projects. I mostly sew for myself, but I’ve made a couple of purses for my daughter. I’m into paper-pieced potholders right now. I sew mostly for myself making clothes, but I also enjoy making quilts and other gifts for others sometimes. I make quilts, handbags, slipcovers, clothes, and anything I can dream up. I love my Berninas and they make being in my studio so much fun. I primarily sew for others but do enjoy making a special quilt for myself now and then. I mostly make quilts for my family. I mainly sew for others, and make quilts, pouches, bags, and children’s clothes. Thanks for the chance to win! I mostly sew for my family, or at least most of the projects that I actually finish are for them. I’m a quilter, but I also like to make bags. I am primarily a quilter, but in the past year, I have become very interested in sewing purses and tote bags. My quilts are primarily done for charity, or baby quilts for friends. Tote bags are for both myself and friends. I enjoy making quilts for charity and friends. I mostly sew for myself :). (It is selfish sewing week right?!!) I mix it up with garments, quilts and bags :). Variety! I seem to sew for others the most. Mainly my daughter and coworkers for new babies in their families. I usually quilt for others. I make quilts, wall hangings, stuffed toys, anything they ask for. I enjoy taking a picture of a quilt and sending it off to my critics (children). The best response is “who is that for” then the first one to ask for it gets it, unless my husband says “that one is not leaving the house. Thank you for the great tutorials, projects, etc. Most of all a big thank you for a chance at the giveaway. I sew for myself making quilts. I used to sew mostly clothes for myself. More recently, my sewing is almost exclusively gifts – taggies, baby blankets, napkins, mug rugs. Anything fast and easy. I make quilts for just about everybody but me. I do on occasion keep one or two. They seem to go to just about every charity , friend and family there is. I make alot of apparel and I start it mainly for me and end up “feeling” that I made it for someone else. I love making retro outfits, I will be starting on Gerties wardrobes, from her two books. Myself and my 2 year old 🙂 I like quilts most but want to get more into apparel for my littles. I sew for my family. My baby twin boys, mostly! I sew for others, my granddaughter, friends, charities and fundraisers. I feel like sewing for others gives me a purpose. I think the last thing I made for myself was a pin cushion, but then I made 10 more to give away. so fun to make quicker projects. Love to sew on my Bernina! I sew mostly for others, but keep a few things. The majority of time is spent on quilting and machine embroidery. I quilt and longarm for customers as well. I love making specialty clothing (weddings, christenings, etc. ), too. Anything connected to my studio makes me happy and in my sweet spot! I sew mostly for myself, to enter quilt shows. I mainly sew for others. Little zippered bags. I am teaching myself to quilt and mostly make small quilts for myself. I’ve made a baby quilt for my daughter and a couple bigger projects. Machine quilting on my machine is difficult, so I stick to smaller projects but have a lot of fun. Lots of pretty pillows and wall hangings in the works for family Christmas gifts, though!! I sew for my friends when they give me projects like curtains, duvet covers, capes, tshirt quilts and baskets. I make quilts for my family too. I love to make quilts and other gift items for family and friends. I used to be a garment sewer but these days that’s mainly for my granddaughters! And of course I sew on my 2 Berninas! I sew mostly for my daughters. I sew patches on their Girl Scouts uniforms and mend clothes. We also sew items for donation. Our next project is sewing colorful pillow cases for kids in hospitals. The girls raise money to purchase fabric or accept donations of fabric to make them. I sew more for others than for myself. Mostly I sew for charity (wheelchair and walker bags, adult collars, small dresses for children) and then for my small business (1860’s period clothing, alterations, etc.). when I sew for myself I get frustrated… seems it never fits right. I also sew for family and friends -ie Christmas and birthday presents, new baby items etc. I sew for kiddos, family and friends in my life. I also quilt. I sew for my family and friends. I love to see my grandchildren’s wearing or using something I have made for them with Love ☺️! The vast majority of my sewing is quilts that I give away. Two years ago it was a huge year for me – over 30 small quilts given away and three bed size. Most of my smaller quits have been given to breast cancer fund raisers. My family gets the bed size!! Nephews and nieces! Now that I am in my senior years mostly sew quilting projects for our my home and for family. Pieced a dresden plate bed runner which is used on the foot of the bed and also on the dining table. And like to make new quilt blocks not done earlier, so have several “orphan” blocks around here. After many attempts have not mastered FMQ on my Bernina 440QE and this has been a disappointment to me. Will keep trying as do not believe in giving up. I sew for others, home dec and quilt. I usually sew for family and friends, making bags, pillowcases, quilts, sewing notions, and apparel. I sew clothing for babies, toddlers and young children. I also sew quilts with matching pillowcases. These creations of mine are given to those in need or as special gifts. I sew for others. Lately it has been lap quilts and bags. I love to quilt table runners and lap quilts. I also sew most of my personal garments. With a one month old granddaughter, I can see my future sewing heading in the little girly fashions direction. Can’t wait. Quilts for family and friends. My sewing is limited to quilting. So far, I have given every quilt away, but I am currently making one for myself. I sew mostly for various charity projects like RotaPlast, quilts for chemo kids, police cruisers, Dyalisis Centers, KonKer Cancer, Cambodian Kids orphanages, Veterans, animal shelters and many more community projects. And then I sew many presents. So much fun! When I sew, the act of sewing is my hobby, my love and that part is for me. But what I am making may become a gift for someone else! …. 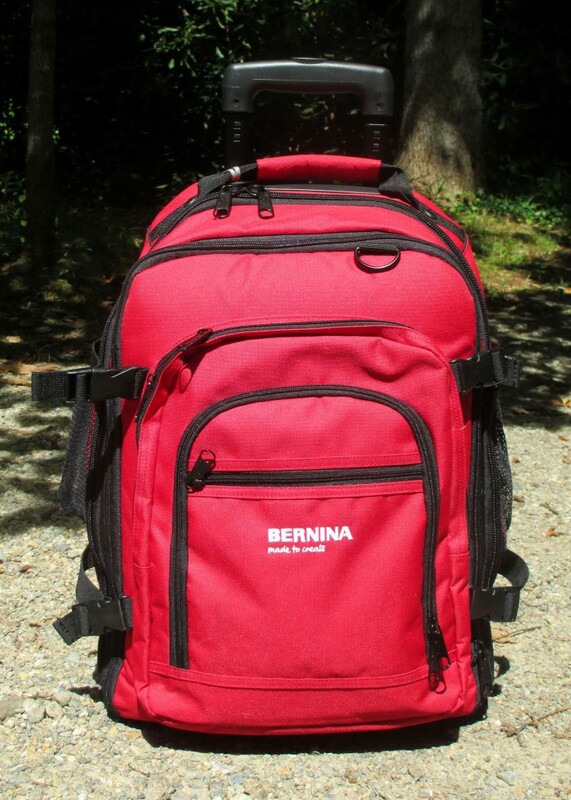 Celebrating 50 years of sewing this year and 30 years of sewing on Berninas. <3 Them! I sew mostly baby things. Baby quilts, burp cloths with embroidered names. I sew equally for myself and for others … quilts, table runners, tissue box covers, potholders, slippers, etc. I do mostly quilting & machine embroidery. Some are gifts & most are keepers. Family and friends as I love to make clothing for my pre-1840 reenacting. When not doing that I love to do machine embroidery. Primarily, I make quilts (especially for the grandchildren), but I also make bags, charity pillowcases, and this month, Halloween costumes. I mostly do sewing and quilting for others as gifts! I sew for my two granddaughters and one that is due at Christmas. Burp clothes, receiving blankets, baby toys, quilts. As they get older different things, play aprons, pillow cases and anything they think up! Also make bed size, and lap quilts for family and friends. Started doing t-shirt quilts for other people that want them for their children. Then the usual mending of hems and pockets and such. I quilt for may family. Make clothing for my grandchildren. I sew for my friends’ kids and grandkids. I sew a little for myself, but mostly for them. A little of everything! It’s usually given away so I have room to make more! I am a disabled sewing specialist…a former Bernina sewing educator in Tulsa, OK for over 15 years and have taught all over Northeastern Oklahoma. I developed sewing classes at Tulsa Technology through the Adult Education program for over 12 years and taught; fitting, quilting, how to use your serger, lingerie, home decorating and much, much more. I continue to sew for the love of my family, my grandchildren and my former students and friends. Salute to BERNINA for the most remarkable sewing machine in the world!!! I see mostly for others and I make a lot from garments to bags to blankets and home decor…love it all. I am currently sewing for Quilt for Kids. I also make quilts for family and friends special occasions. I mostly sew for others, especially my Granddaughter. I do keep some quilts, but give most away. Love the look on the person’s face when they open it; makes me love quilting. I piece/quilt, started 10 months ago. Totally love it. So far I have made 7 quilts which I have given to family members. Getting ready to start on a charity quilt for a local abused women’s shelter. Thank you for all that you do, love your site. I am almost always sewing for others. I make wallets, purses, tote bags, and phone clutches. I hardly ever make anything for myself!! I do so for myself but enjoy sewing for others much more. Since I’ve started quilting, I love making quilts for gifts…baby quilts, wedding quilts, and donation quilts. Now with a new granddaughter, making clothes for her 🙂 Since I bought a Bernina, sewing everything has been so much more enjoyable than on my old sewing machine. I began sewing with a group making Little dresses for Africa last year. This past summer, we began a new group sewing shorts and skirts for Swaziland, Africa. I personally know a lady and her husband that go there on mission trips, yearly. We have donated garments to local charities and hope to continue doing so. We are in the process of making sleeved dresses (I have almost 50 cut out,ready to sew, now! )and shorts to continue “paying garments forward” to girls and boys, as we learn of needs! What a joy!